Think you know your history? Chances are, as much as you think you know there’ll be huge gaps in terms of when something happened, when certain people were born, and when specific events unfolded. In Timeline the idea is to position your cards in the right place on the ever-growing timeline of events (in this case all linked to Britain), and even though you never need to know the exact date of when something happened, you’ll need to relate it to other things that have cropped up over the course of British history. 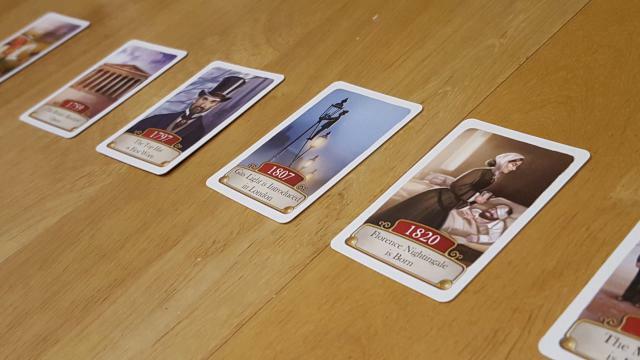 Starting with a single card on the timeline, the idea is for each player to position their card in the right place. Initially this is a simple before/after decision, but as more and more cards get added to the timeline you need to be far more precise. Were the police force founded before or after Florence Nightingale was born? Did Britain get gas powered street lighting before the Queen came to power? If you’re lucky your cards might be obvious – one card, for example, covers Britain physically becoming an island, while another is Britain’s (still bizarre) choice to leave the EU. Get either of those and that’s one card you won’t struggle with, but with a huge number of possible events to end up with in your hand you’ll be lucky to get that. So, you position your card (date side down) where you think it goes. The card is then turned over, and if it’s right it stays in place date side up, and the timeline ends up being slightly longer and slightly more difficult to add to. If it’s in the wrong place it goes back to the box and you collect another card to replace it. Whoever gets rid of all of their cards first wins – the rules are as simple as that. As a result of the easy rules but hugely addictive games, this makes for a great party game. Each game is pretty quick, always ends up with someone screaming at themselves as if that would somehow make them suddenly have the right answer, and has enough “really? wow…” moments to make you feel like you’re actually learning something, which is a nice touch. The one final thing which I think is spectacularly brilliant as that there are LOADS of these sets. There’s one about inventions, cinema, historical events, all sorts. And you can mix them up, giving yourself a massive deck of cards which will throw up all sorts of tricky combinations, and considering these sets are pretty cheap it’s not out of the question to grab a couple at once and start off with a more varied game. 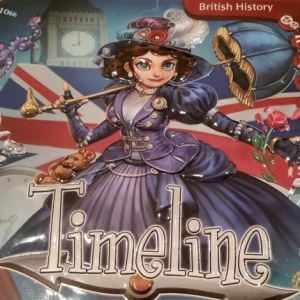 It might be that you’ve already got one of the other sets, in which case you’ll probably know how good this game is and should be grabbing the Britain version right now. If not, and you’re new to the idea, then still get it. Everyone can play, everyone can enjoy it and even if it’s something you only play occasionally the bargain price will ease your worries about value for money. Very highly recommended!